When performing live a musician can give a refreshingly different sound to the same works recorded in the studio. This can be attributed to the excitement of the one time event as well as the adoration of the audience. 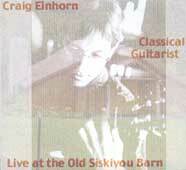 On September 14, 2002 I gave a concert at the Old Siskiyou Barn in Ashland, Oregon. Rick and Joanne Soued converted the old Siskiyou Barn, near Ashland, Oregon, into a small concert hall which seats a little more than fifty people. The Soued's maintain a concert series year round. I prefer this size audience more then any other and I would be hard pressed to find a venue with better acoustics and a more comfortable environment. Like most of my live performances I present many varying styles from different centuries and countries which are played on the Classical Guitar. In addition I consciously ignore boundaries between Classical and Popular Music. Two songs which appear on the CD are "When I'm Sixty-Four, by the Beatles, and an original song based n a Native American Chant entitled, "O Great Spirit". The last four songs (tracks 13-16) were not recorded at the Old Siskiyou Barn but were added to increase the playing time of the CD. On these four English Renaissance songs I accompany Sharon Rogers at her senior recital at Oregon State University in Corvallis, Oregon. Sharon is an experienced folk singer who returned to school in her mid forties to master classical voice. I have been continuously impressed by her accomplishments. The four Dowland songs were originally written for lute and voice. I tuned my guitar like a lute and played my parts almost flawlessly; a rare event for most classical musicians. Sharon's voice fits the style well.